What Herb Do You Use For. . .? “I want to get some herbs for my headaches. What do you suggest?” When I am in the health food store buying groceries, I hear customers aiming these kinds of questions at the staff. The staff usually does not answer them, because they are not legally allowed to diagnose or treat health conditions. I don’t answer such questions, either, even though I have an acupuncture license and herbal treatment falls within my scope of practice. I am an herbalist who uses Chinese herbs, and we don’t prescribe herbs that way. Here’s a short primer on using Chinese herbs. 1. Chinese herbs are prescribed by syndrome, not symptom. We see the body as a complex grouping of activities, and see illness as a hiccup in the organization of those activities. We have names for the system breakdowns that cause problems. Sometimes a body runs too hot, or too cold, or doesn’t handle food or humidity or stress well. Sometimes energy gets stuck in one place, or because of overwork or poor sleep there is not enough energy. We use herbs, as well as acupuncture, meditation techniques, and other tools, to restore balance in the system. For headaches, some are caused by fatigue, some by frustration and stress. Still others are caused by becoming overheated, or because of old trauma or hormone shifts. Each of these causes might need completely different herbal treatment. To give someone the wrong herbs could aggravate the system breakdown and make the headaches worse instead of better. Chinese herbs are primarily used in formulas. When patients ask me for herbs, they usually expect me to give them one name, like a TV talk show doctor might. Feverfew for headaches! St John’s wort for depression! Black cohash for hot flashes! But Chinese herbalism has developed over thousands of years. Herbalists have learned that using just one herb for a person is not the most effective way to treat the whole person. I have treated many people who have not had good results with the one herb treatment. The one herb they chose may not have addressed their syndrome properly, or it may have aggravated another condition, or it may simply have not been strong enough on its own. In a Chinese herbal formula, some herbs are for the underlying syndrome causing the symptoms that are uncomfortable. Some ingredients help with digesting the overall formula. Others are added to minimize the chance of any side effects. Still others are used to strengthen general health to prevent the problem from happening again once it is resolved.When I look at a bottle of herbs from a health food store or a multi-level company that sells herbs, even if they are in a formula, almost all the herbs are for the same symptom. There is rarely an attempt to make the formula address the whole body (except when the company uses a Chinese medicine formula–but even then, they market it as being used for a symptom, not the underlying cause). We consider putting every herb that treats a given symptom into one formula as overkill in most cases. Chinese herbs are ideally custom prescribed for the individual. Sometimes companies sell a “one size fits all” formula because the people creating the formulas are not trained herbalists; often it is because they are mass marketing a formula to the general public, and know the average person with a headache doesn’t know what causes it. Chinese medicine has fallen into this trap, too. Go into most Asian markets, and you’ll find formulas for fertility, for PMS, or for headache. These formulas may be frequently used formulas developed over hundreds or years or more, and may work for the majority of the people who try them. But they are still not aimed at the the exact syndrome affecting the individual buying them. 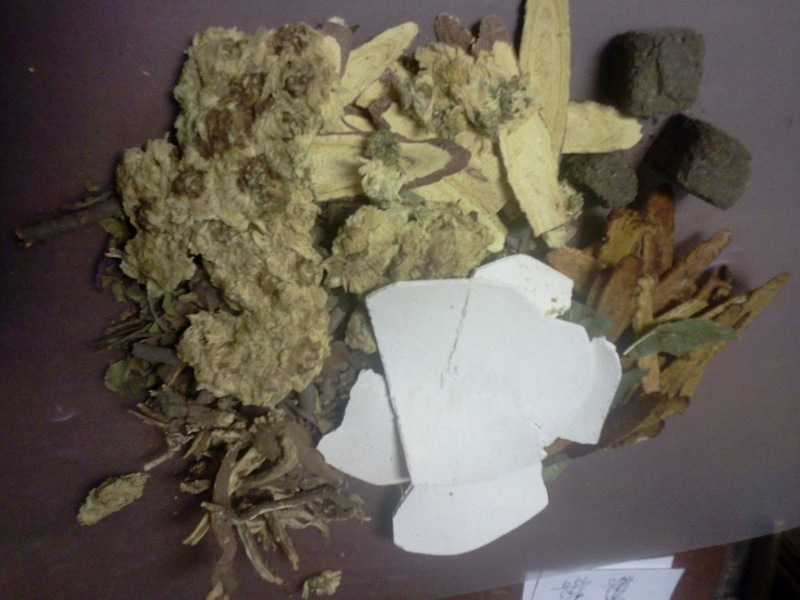 The ideal way to purchase Chinese herbs is from an herbalist trained in Chinese medicine. We will talk with you about all your health problems, and make you a formula that will begin the process of re-balancing all of your systems. If you only treat the one symptom that is bothering you the most, it is like taking someone spinning 5 plates and only keeping one balanced. While even a master herbalist cannot always treat every problem at once, we can usually trace a common cause for most of the problems and treat that first. As that system failure is fixed, more than one symptom will begin to improve. If you have headaches, you may find that not only do they get better, but your sleep improves too. Or your digestion is better. Or you catch fewer colds. Treating the underlying cause of health problems has the effect of improving how you feel overall. Holistic medicine in general takes the long view. We don’t treat you just so you feel better next week, but have side effects from treatment that will cause you problems in a few years. We look to your future, and correct as many of the system faults as possible, so that your health continues to improve over the long term. Not every problem can be cured, but with good health practices and herbs that balance your body rather than simply try to mask a symptom, we can help you to feel better overll. Author teresaygreenPosted on June 17, 2015 November 6, 2017 Categories chinese medicine, depression, herbs, hot flashes, master herbalistLeave a comment on What Herb Do You Use For. . .?